We’d love your help. Let us know what’s wrong with this preview of Backpacker the Survival Hacker's Handbook by Backpacker Magazine. To ask other readers questions about Backpacker the Survival Hacker's Handbook, please sign up. This definitely a book you want to have on hand on your next adventure! There were so manh new things that I learned in this guide and found it quite intriguing! This should be mandatory reading before anyone ever sets out on even their first hike. It covers how to survive most wilderness emergency situations - from getting lost, running out of food or water, encounters with predatory wildlife, and assessing and treating injuries - both when you have appropriate gear and when you don't, with helpful illustrations in some cases and accompanied by heart-pounding true tales of survival. If you've read Mountaineering: The Freedom of the Hills (which, if you' This should be mandatory reading before anyone ever sets out on even their first hike. It covers how to survive most wilderness emergency situations - from getting lost, running out of food or water, encounters with predatory wildlife, and assessing and treating injuries - both when you have appropriate gear and when you don't, with helpful illustrations in some cases and accompanied by heart-pounding true tales of survival. If you've read Mountaineering: The Freedom of the Hills (which, if you're doing any semi-serious backcountry activity, you should have) or many other well-known preparedness books, you'll know a good bit of this information. But it's always good to have a refresher, and this book's inclusion of "MacGyver-ing" survival tools based on things you might have in your pack or find in the wilderness around you makes for interesting and potentially life-saving reading. I haven't backpacked or camped in years, but found lots of interesting survival information that could come in handy. One never knows when a disaster will strike and I, for one, am not counting on government help. Sometimes self sufficiency is a good thing! In my opinion, anyone who hikes or camps or even car or rv travel should read this book. Loads of common sense info that could be very helpful in an emergency. I received a Kindle Arc in exchange for a fair review from Netgalley. 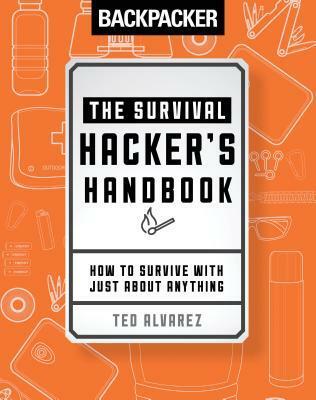 Backpacker: The Survival Hacker's Handbook by Backpacker Magazine (and Ted Alvarez) is a free NetGalley ebook that I read in late April. Each of the authors' voices are approachable and had deliberately wrote this book to be helpful and practical, rather than to offer information in the vein of a doomsday survivalist handbook. They've tried out all of the tips themselves and admits that convenience items (like matches, plastic bag, pop cans) save for a lot of stress, but to use them wisely as too Backpacker: The Survival Hacker's Handbook by Backpacker Magazine (and Ted Alvarez) is a free NetGalley ebook that I read in late April. This book would make a great gift for anyone who hikes or likes to camp outside. There is a lot of great information on how to survive outside. I enjoyed the short survival stories that were mixed in with the tips. While I'm not a frequent backpacker, I like to be prepared. This book is a good way to get prepared. I hope I never need the emergency suggestions it lists! Full review can be found here: https:/ I thoroughly enjoyed The Survival Hacker’s Handbook and while I haven’t been backpacking in a while, reading it perversely encourages me to get back out on the trail. Alvarez constantly advises the reader to practice the survival skills. And why not build a shelter in your backyard or the next time you go car camping? I’m sure it would be lots of fun!